From Harry Kane's prolific record on the road to Chelsea's unbeaten run and Fulham's woeful record, we pick five essential stats ahead of the next round of live Sky games. Tottenham play their third game in six days on Saturday and Harry Kane will head to Wolves having registered 26 goals in his last 26 away appearances in the top flight. Just over half of Kane's 113 top-flight goals for Spurs have come away from home. 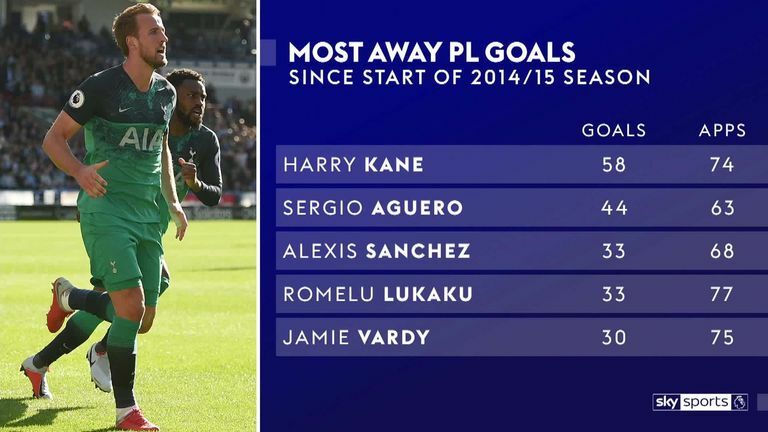 In fact, since the beginning of the 2014/15 season - his first as a regular with Spurs - no player has scored more on the road in the Premier League. Wolves welcome Kane and Co to Molineux having lost back-to-back league games for the first time under Nuno Espirito Santo - following defeats by Brighton and Watford. And that run might be tough to end on Saturday. Tottenham have taken 74 points out of a possible 78 against promoted sides under Mauricio Pochettino - more than any other Premier League side. On Sunday, Chelsea play Crystal Palace at Stamford Bridge, aiming to preserve their unbeaten league record under Maurizio Sarri. This season represents the fifth time the Blues have avoided defeat in the first ten fixtures of a top-flight campaign. On two of the previous four occasions - both in the Premier League era - Chelsea extended their unbeaten start to 11 games and went on to win the title on both occasions. But Crystal Palace will be buoyed by their 2-2 draw against in-form Arsenal on Sunday. Both of Palace's goals in that match came from penalties, the second of them awarded for a foul on Wilfried Zaha - who also earned Roy Hodgson's men a spot-kick the previous week against Everton. Chelsea are yet to concede a penalty in the league this term - and they will have to work out a way to deal with Zaha. He has scored in two of his last three appearances against them and has won the joint-most top-flight penalties since the beginning of last season. Monday Night Football pits the lowest scorers in the Premier League this term against the team that has shipped the most goals. We cannot promise fireworks when Huddersfield host Fulham on Bonfire Night, but David Wagner's side will certainly fancy their chances of ending a run of seven home league matches without a goal when they face Fulham. Slavisa Jokanovic's side have the joint-worst defensive record after 10 games in Premier League history. However, should Huddersfield fail to score on Monday, they will become the first team in the history of the division not to score in their opening six home games of a season. Your live Premier League action this weekend starts at Molineux as Wolves host Tottenham live from 7.30pm. On Sunday we are at Stamford Bridge, as Crystal Palace look to end another unbeaten run at Chelsea from 3.30. And on Monday Night Football it is Huddersfield against Fulham, with coverage from 7pm. All three games are on Sky Sports Main Event and Sky Sports Premier League.